You may have been wondering about those little blue lights at the back of traffic lights at six major intersections in Mill Creek. Tom Gathmann, Mill Creek's acting City Manager and full-time Public Works Director, reported that the rumor they were cameras "went viral on Facebook" in the May 22nd Mill Creek City Council meeting. Rest assured they are not cameras spying on your every move. The small blue LED lights installed on the back of these traffic signals are only powered when the traffic light on the front side is red. This helps police officers detemine whether or not vehicles entering the intersection from the oppolsite direction have run a red light. 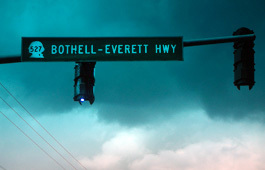 The cities of Everett and Mountlake Terrace have similar installations. The lights were installed by the Washington State Department of Transportation at the request of the Mill Creek Police Department. The total cost of this public safety project was $6,000.